Me with my bear Norwegian friend! This is something of a new venture for me, a departure from my other site www.johnnybeerling.com. This site,being much more user friendly, means that I can edit and add to it easily an quickly and thus provide followers with more information about my travels on the oceans of the world and add pictures and blogs about Susan and my adventures. So please feel free to explore and do leave messages with comments on the "Contact" tab and I will endeavour to respond as soon as I can. 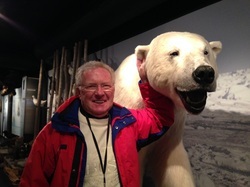 On the left here is my Polar Bear Norwegian friend whom I met on our last cruise inside the Arctic Circle, that was some trip and we had a wonderful time and even managed to see the Northern Lights several times. You can read all about it and see pictures by clicking on "My Lectures and Cruises" tab. If you have logged in to find my book, "Inside Radio 1" please click on the link above labelled "My Book".